RIT’s MAGIC Spell Studios opened a new 52,000-square-foot building adjacent to Frank E. Gannett Hall this fall. The new facility is where students will turn ideas for film and animation, games and digital media into commercial products. RIT’s MAGIC Spell Studios opened the doors to its new home this fall, inviting students, faculty and industry professionals to experience a digital media development and publishing learning laboratory never before seen in the Northeast. The 52,000-square-foot-building houses a 7,000-square-foot sound stage and a 180-seat movie theater with 4K projection capabilities and Dolby Atmos sound. There’s an audio mixing room, color correction room, game design and media development laboratories, 2D and 3D animation classrooms, and several lab spaces including stop-motion and augmented reality/virtual reality. The real edge though, said MAGIC Spell Studios’ newly appointed Director David Long, is that the facility brings together students and faculty from different disciplines and enhances and complements what they are learning in the classrooms. Students can walk in with ideas for film and animation, games and digital media and walk out years later with a marketable product. They spend the time in between using the state-of-the-art resources in the building to make it. That’s a win not only for the university, but for the state, he added. When students commercialize their work, it will ultimately result in new companies and new jobs in the upstate New York region. 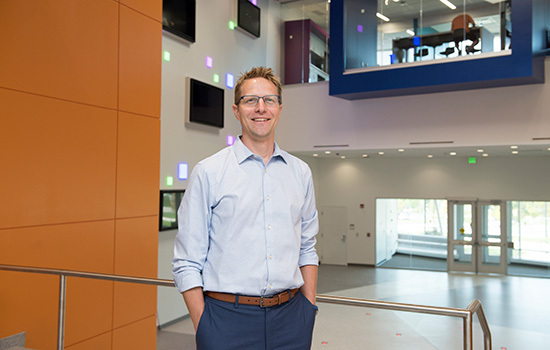 Nearly five years ago, Andrew Phelps, founder and former director of RIT’s Center for Media, Arts, Games, Interaction and Creativity (MAGIC), recognized the value of linking RIT’s internationally ranked academic programs with high-tech facilities needed to bring computer games, film and animation and digital media projects to the marketplace. Phelps wanted to build a “collaborative sandbox” where students from any major could create things together. MAGIC Spell Studios was officially formed in 2013 and operated in Student Innovation Hall. But Phelps didn’t only want students to come up with ideas. He wanted those ideas to be commercially viable. In 2014, Dan Plate ’16 (illustration) and Gary Porter ’15 (game design and development) began the development of a video game called Super Daryl Deluxe while they were students working with MAGIC Spell Studios. Earlier this year, the game launched on the Sony PlayStation 4, Nintendo Switch and Steam platforms. In 2016, RIT became the first university to publish a video game on the Xbox One platform with Hack, Slash & Backstab. The game, which also debuted on the Steam platform and the digital storefront Humble, was produced in residence at RIT in a studio course offered through RIT’s School of Interactive Games and Media and the RIT MAGIC Center. It was published and is maintained through MAGIC Spell Studios. And last year, a team of students in association with MAGIC Spell Studios worked with the Buffalo Bills to create an interactive app allowing football fans at New Era Field to use virtual reality to “see” the stadium from a unique perspective. The resulting app was the first of its kind in the NFL. “This is just the tip of the iceberg when it comes to having student games published and film and animation projects produced,” Long said. 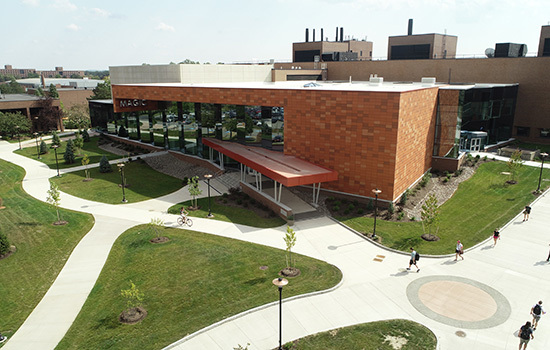 The new MAGIC Spell Studios building was made possible through $13.5 million in funding from New York state, $3 million from Dell, $12.4 million from Cisco Systems Inc., $1.5 million from The Wegman Family Charitable Foundation and $1 million from RIT Trustee Austin McChord ’09. The investment is designed to stimulate the economy. And it couldn’t have come at a more perfect time. Industry analysts are predicting that the international games market will likely surpass the $138 billion mark by 2021. Conservative estimates show that the worldwide film industry has already surpassed $300 billion annually. At RIT, interest in the highly competitive film and animation and game design and development programs is skyrocketing, with game design and development enrollment increasing nearly 150 percent since 2009. That interest is expected to rise in the coming years, and MAGIC Spell Studios allows RIT to accommodate the demand. The assets of MAGIC extend beyond the building to help entrepreneurs and start-ups develop new products and spur economic growth throughout the state. For example, RIT was named one of three Digital Gaming Hubs in New York state by Empire State Development in 2016. The gaming hubs provide resources and mentoring to encourage students and entrepreneurs to enter the growing games industry. As part of MAGIC Spell Studios, outside companies will be invited to campus to expand and work in a dedicated collaborative partner suite. Forbes Media is the first in-residence company that is providing experiential learning opportunities for students. Companies also can book commercial projects in studios that rival the best facilities from New York City and Hollywood. Aaron Gordon ’13 (film and animation) has done that with his Rochester-based production company Optic Sky. Optic Sky used the sound stage, which meets the requirements for the New York state film tax credit, to shoot a commercial. Gordon, whose company graduated from RIT’s Venture Creations business incubator in 2015, said that his clients see the benefits of filming on location in western New York versus major hubs. RIT publicly launched a $1 billion blended campaign in July. To date, more than half of the money has already been raised, and MAGIC Spell Studios is one example of how students are already benefiting. Transforming RIT: The Campaign for Greatness seeks support from a variety of investors, including alumni and friends, government and corporate partners, and research foundations and agencies. To learn more, go to rit.edu/transformingrit.